First, go to your Client List page by finding My Clients > View All in the navigation bar. Click the more button next to a client and click the Export data button. Select the items you'd like to export for this client. Hit Create Archive in the toolbar to start the export process. We'll send you an email when your client archive is ready. You can view your client's export history by selecting Export history from the more button in the Client List. Your exports will remain accessible for 48 hours after which they will be purged from our system. We do not keep backups of these exports. 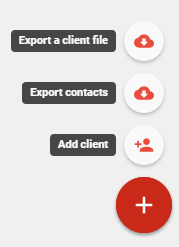 You can also export your client contact information (first name, last name, email, etc) as a spreadsheet to keep for your records or to import into your campaign management tool.